I can't believe I have been creating new works and blogging about then for 40 Weeks. As I was setting up the graphics for the blog I look at the last entry and couldn't believe my eyes. 40!!!! Really!!!! Wow!!!! It has been fun and trying at times! I find it harder to stay on course when I'm getting ready for an art show. During that period, it is hard to work on pieces, get displays together for the event, get together the supplies for the show, and blog all at the same time. This is what they call "Running a Business". I have been working on this business steadily this past year and even though it can be crazy at times, it is worth it when I get such great feedback from all of you. That's what make blogging so rewarding and I thank you all! Well let's take a look at the new addition. I want to work on more Nature themes for the "Art within Art" line and little flying creatures are the focus this week. I will be adding to the series very soon. 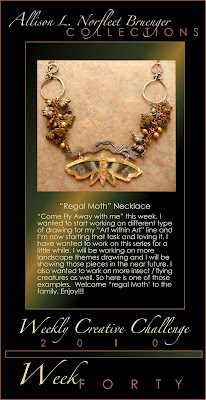 This piece was fun because of all of the fun parts to this piece such as the use of brass and copper, the wire wrapped elements and colored pencils and decorative papers to create the wings. I loved this one because it let me be creative in so many areas. 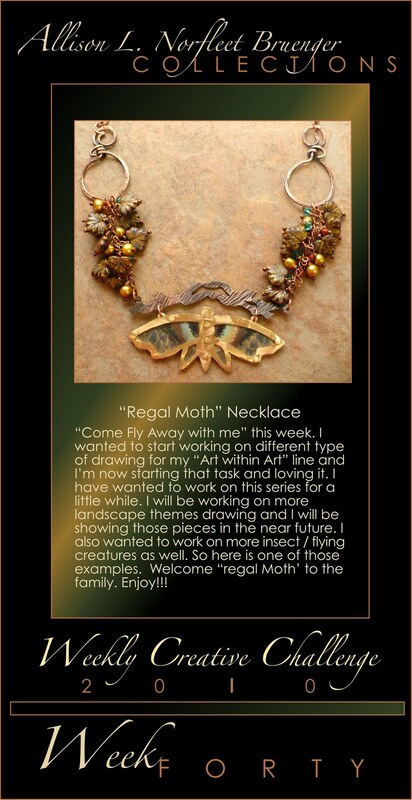 Well enjoy "Regal Moth" and have a wonderful week!